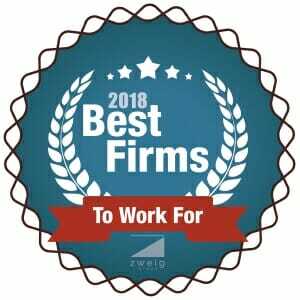 DY Consultants is excited to announce that we were named a 2018 Best Firm to Work For by the prestigious Zweig Group! This award recognizes the top A/E/C firms in the US and Canada based on workplace practices, employee benefits, employee retention rates, and much more. This is the first year DY participated in this competition, thus we are very honored to be amongst the top ranked entities! We greatly appreciate the employees who participated in an anonymous survey rating of our company. We value our staff and will continue to create a culture of trust, stimulate growth, open communication, and autonomy. Click here to learn more information about Zweig’s Group Best Firm to Work For award. DY Consultants Welcomes New Talent to Our Team!